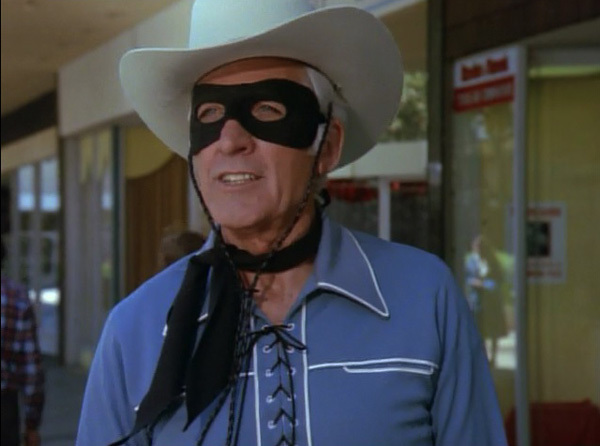 The torch of heroism is passed from one generation of television series to the next, as John Hart, who played the Lone Ranger in 52 episodes of the original series shows up in the first episode this week to give Ralph (William Katt) a bit of much-needed advice. My Heroes Have Always Been Cowboys was written by Cannell and originally aired 29 April, 1981. Ralph is getting ready to hang up the suit after a couple of near-tragedies place human lives in danger at his hands. Shaken, and bothered, he seeks solace in a visit with Hart, playing himself, as he visits some local shopping centers to perform for the kids, alongside Trigger the Wonder Horse. This problem couldn’t come along at a worse time for Bill (Robert Culp), his own hero, a wartime CO, Tracy Winslow (Jack Ging) is now a cop, but he’s on the verge of making a horrible mistake… He and a select few men are planning on ripping off a diamond smuggling ring and their buyers, and then skipping the country. Tracy tries to recruit Bill, but then when Bill thinks he’s making some form of drunken joke, blows the offer off, but they both know things have changed between them now. Tracy continues to play the guilt card, reminding Bill how many times he saved his life, to keep him in check, and it’s proving destructive to the FBI agent. While Ralph finds solace and inspiration in the words the Lone Ranger gives him, Bill must decide what to do, and stands up to a man who was once his hero. A car that Tony grabs for the job has a flame thrower, and suit in the back that was used in the crime, one he is being framed for. It’s fun to note that one of the cops in the initial pursuit of Tony, is Danny Glover! While Ralph strives by the innocent until proven guilty axiom, every one else seems to be willing to think the worst of Tony. Things get worse when Tony’s employers deny the fact that he works for them, apparently because half of their business is less than legit, and the don’t want the Feds crawling all over them. And it may be one of the Feds who is actually responsible for everything…. For the most part, the whole Hinkley/Hanley debacle seems temporarily settled, as the students now simply refer to him as Mr. H.
Oh well, kiddies, believe it or not, there will be more next time!